When I first started blogging, I had very naive ideas. I thought that as long as you wrote a great and interesting post, people would just show up and read it. Well, of course, I try to give it a good title. Then I wondered why no one ever read my blog. 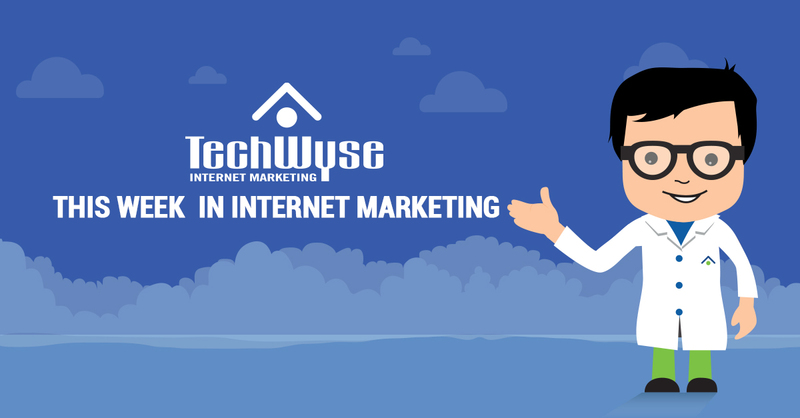 It turns out that there is a definite strategy to creating a blog post or webpage that people will actually click on and read. And a big part of that has to do with the title tag. Nowadays, some people think that title tag optimization has very little effect on a webpage’s ranking. However, a brief example will show that it still makes a big difference. Let’s see what happens when you run a simple Google Search with the words: “on-page SEO”. 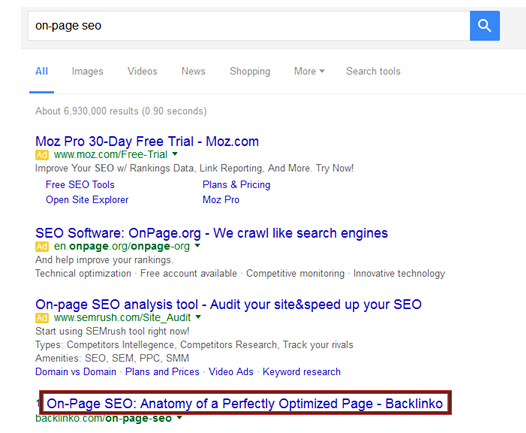 Your top result will be a page from Backlinko with the title “On-Page SEO: Anatomy of a Perfectly Optimized Page”. If you go to the result, you will see that the entire description appears. It also contains words that make you want to open it. Do I want to learn a few easy steps to optimize my page perfectly in this manner? Yes, that’s exactly what I want. Take me there! But What Exactly Is a Title Tag? First of all, a title tag is not the same thing as the title of your post, although this is also important. The title tag is the HTML code, usually found in the “head” section, which allows Google or Bing to find your webpage. If you do not create your own title tag, it will be automatically generated based on the title of your page. To create your own, you may need to install a plugin or enter it as HTML code. You can find this section in your WordPress under the post you are adding. Just use the ‘Edit snippet’ button to be able to add your own title tag and meta description. A good title tag can make your page rank higher in Google. It also affects the description of the page which appears on the results page when someone does a Google search. So a good title tag means that users will be more likely to open it and read it, based on the description. So you can see why a good title, such as “On-Page SEO: Anatomy of a Perfectly Optimized Page,” is ideal for a Google search. A longer, less specific title tag, such as “On-page SEO Techniques, Strategies and Tips which help to improve your ranking” may not work quite as well. 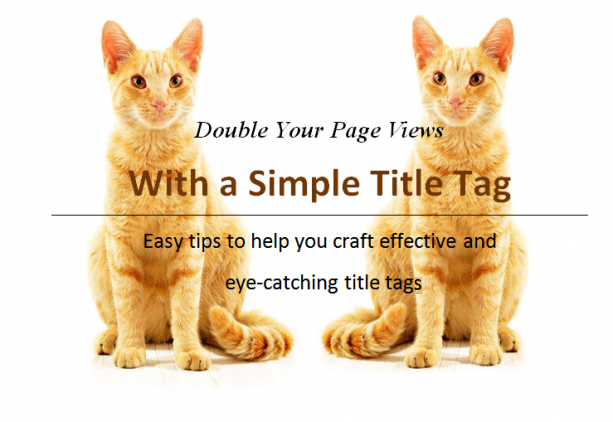 So How Can I Create a Great Title Tag? While there is no one right answer to this question, there are a number of things to keep in mind when composing the perfect title tag. First of all, make sure that the title tag accurately reflects the content of your page. That will improve the usability of your page, which is another ranking factor. Also try to include at least one high-volume keyword in your title tag. Place these keywords near the beginning of your title tag, if possible. Length is another thing to keep in mind, as it affects what users will see in the search results page. Generally, Google will only display a title tag that is no longer than 512 pixels (about the length of one line of text – 50-60 characters). You may sometimes find longer title tags fully displayed on Google, but a good rule is to stick with a title of 55 characters or less. You will want to include your company name in your title tag also. 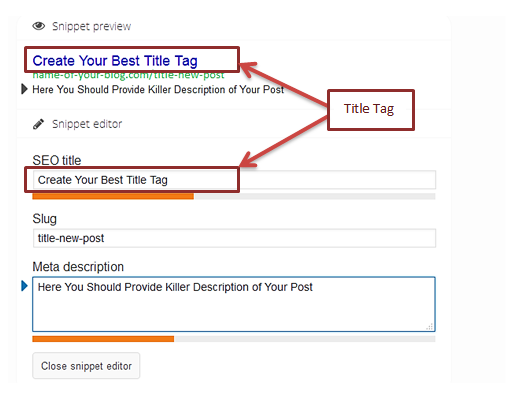 Your title tag should be different from the title tags of any other pages on your site. It also needs to be different from your page title. That will help you use a greater variety of high-volume keywords. Including keywords into the title tag will improve the visibility of your page in Google. According to Moz’s research, it is better to put your keyword as close to the beginning of the title tag as possible. Often, title tags are “machine” generated rather than written by a human person. Google is able to pick up on the nuances of these tags and label them as spam. Strive to craft a unique title tag. If 50% of the words in your tag resemble any other title, this is a hint to Google that it may not be original. If you took the time to create great content for your webpage, you’d definitely want people to find it and read it! So don’t underestimate the beautiful simplicity and effectiveness of a good title tag. In fact, after your page is published, you may even want to go back and split test different title tags to see which one generates the most traffic for your site. A webpage can do its work only if people can find it. So do your best to make that happen. Veronika Kavanova is Head of Marketing and PR at freelancehouse.co.uk, a healthy lifestyle freak, and Game of Thrones enthusiast. Feel free to contact her on Twitter any time. Awesome tips, Veronika! This was really helpful, because grabbing consumers’ attention quickly and efficiently is one of the most important aspects of marketing a business. We have so little time to communicate our brand to today’s short attention spans. I especially appreciated the list of powerful words!